"All through these Olympics I hear them say, 'Boy, boy, boy, you're doing well.' I am tired of that. I want the whole press of the world to hear what I say and either say it as I say it or not say it at all." - John Carlos, speaking after he and Tommie Smith gave the now famous black power salute on the medal stand in 1968. The Guardian initially buried the story in the last paragraph of an article about 400m runner Lilian Board. "The American Olympic Committee has made a crashing mistake in sending back the black athletes who gave the Black Power salute during the medal-awarding ceremony. In making this gesture, these men were dedicating their victory to their black fellow-countrymen and using the occasion to ventilate their very real grievances. They could scarcely have done so less violently or with greater dignity: they deserved and probably won admiration, not condemnation." - The Observer, blasting the USOC's decision to dismiss Smith and Carlos from the US team and Olympic Village and predicting how the public would react to the demonstration. LetsRun.com 2008 PreNCAA XC SuperPolls: Oregon Ducks Reign Supreme Vin Lananna's Oregon Ducks are #1 on the men's and women's side, but many of the LetsRun.com faithful are backing German Fernandez and the OSU Cowboys. Can the Cowboys do the unthinkable and defeat last year's national champions who return their whole squad? First up for the Cowboys is the Big 12 meet, where Mark Wetmore's men have been a perfect 12 for 12 in the Big 12. Is this year unlucky #13 for CU? Voting to reopen after this weekend's Pre NCAA action. 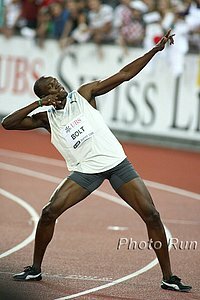 IAAF Athlete of the Year Candidates Announced Cast Your Vote Practice voting as the US presidential elections approach. Geb On Future Plans, Usain Bolt's Accomplishments Geb didn't mind Bolt's celebrations a bit, said he and other Ethiopians back in Addis Ababa watched sprinting for a change, just to see Usain. Business News: *Devine Racing Partners With Rock N Roll Marathon Competitor Group on Vegas Marathon It shows how far Devine has fallen that he has to take in a partner on Vegas. If Devine can get 30,000 (see below) in San Antonio then Vegas should have 50,000. Total BS: ING NYC Marathon Seen by 312 Million People World Wide We guess we should start saying our website gets 10 million visitors a month if that's all marketing is. It's apparently three times bigger than the SuperBowl (95 million) was in 2004. LRC The Week That Was (is finally back) Our recap of the highs and lows of the previous week is back after a longer-than-anticipated hiatus. Don't call us lazy; The Week That Was was listening to its body and taking a much needed break but is back in decent form considering it's a bit rusty. We recap a remarkable performance in Chicago, two remarkable performances in Rio, the first sub 26-minute 10k, Wesley Korir, the end of the $105,000 Brooks Johnson era at USATF, secret drug emails, and more. Moses Mosop Wins Italy's Giro al Sas in Trento Mosop missed the entire summer with an injury. New CERA Drug Test Casts Shadow Over Beijing Olympics The IOC was expecting to get 40 positives. They only got 6. How many more cheats will CERA unveil? *Is Catherine Ndereba The Greatest Female Marathoner Of All Time? Rank your top 10 as Philip Hersh of the LA Times thinks so. *CAN I RUN A 2:50 MARATHON OF 50 MILES a WEEK?